Since 1975, our company has been consistently supplying the mass catering professionals with reliable and high-quality services. Our qualified team is in charge of accomplishing from concept to design the customer’s project in accordance with the HACCP principles. Moreover, our experts identify and respect the customer needs and demands with a view to propose reliable and practical solutions. Thanks to our consistency and excellent quality, our competitive prices and constant technical support for both warranty and out of warranty repairs, we have reached a long-term customer trust. Our Company operates a quality management system according to ISO 9001:2008 standards. We strive to maintain high-quality standards for both the manufacture and trade of Ho.Re.Ca. equipment in order to meet customer requirements. To this end, we employ highly qualified and experienced personnel and above all, a sound organisational structure based on fully functional technological facilities. Moreover, our approach to continuous improvement aims at responding effectively to the increasing demands of the Ho.Re.Ca. industry. How does the company ensure product quality? Our primary concern is to ensure the quality of our products. For this reason, we source over 90% of raw materials from European suppliers. Additionally, we carry out regular controls throughout the production phases in accordance with the principles of ISO quality management systems. Moreover, we conduct extensive research on the product improvement and maximum operational reliability. 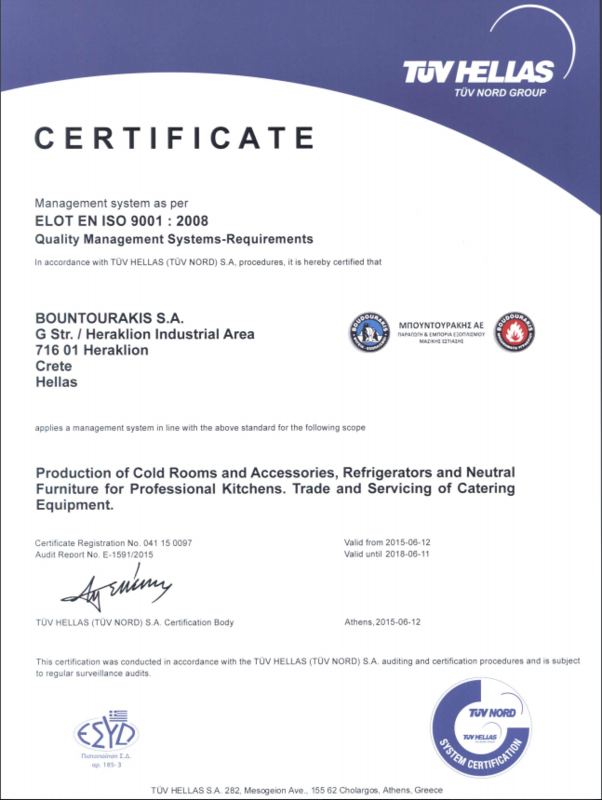 Why choose BOUNTOURAKIS S.A. for purchasing RATIONAL products? In Bountourakis S.A., our philosophy is mostly customer-centric, and we strive to provide trustworthy customer service for all our products, especially for the RATIONAL appliances. As an accredited Rational Service Partner, our Company knows how to guarantee a professional service at all times. Our technical specialists attend ongoing RATIONAL seminars and training in order to offer exceptional technical support and customer care services. That is to say, our Company carries an extensive range of spare parts in stock to enable quick repairs; we offer personalised expert advice and installation guidance to assure that the oven will be installed in line with the manufacturer’s recommendation; also, we provide loaner oven if the repair cannot be on site. Other than the Cooking Live demonstrations, we present academy courses tailored to chefs. In other words, we steadily seek to enhance and promote the unique cooking experience of the SCC and VCC systems. What are customer benefits of choosing BOUNTOURAKIS S.A. as the premium dealer of TECNOINOX? Our company is the exclusive distributor and premium dealer of the Italian brand TECNOINOX in Crete. Thus, the benefits offered to our customers are the following: (3) three-year manufacturer’s spare parts warranty, shipping within 24 hours /two-weeks for a great variety of machines, a wide range of spare parts, and technical support for the appliances repair. Please use the quotation form, or contact us by phone +30 2810380991 or by email: info@bountourakis.gr. We offer a one-year (1) limited manufacturer’s warranty on all our products, except for those indicated below. Click here to download the warranty form. What happens when warranty expires? The products marketed by BOUNTOURAKIS S.A. receive technical support by our technical specialists. Moreover, our Company provides a great variety of spare parts intended for appliances repair. For problems/breakdowns, please call at 00302810380991 to schedule an appointment for the operational control of your equipment.